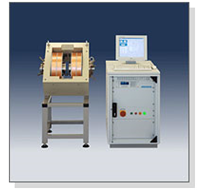 Electromagnet systems with different power levels to produce homogeneous magnetic fields. Usable for calibration of sensors, testing of magnet systems and Hysteresis measurement. Adjustable air gap from 0 up to 60 mm. Field strength in the air gap up to 3 Tesla. Software program for control and evaluation.